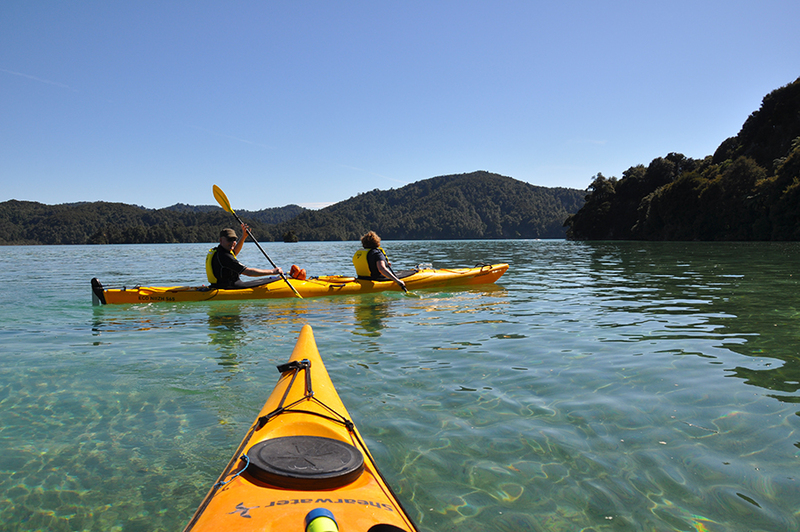 Explore Abel Tasman With Us! Our trips are run daily from the Awaroa Lodge. We always operate return trips which start and finish at Awaroa Beach. Being based at the Awaroa Lodge and having all of our gear on site means we can run trips which make the best of the conditions on any given day. Awaroa is an exciting and dynamic marine environment. We like to keep our trips flexible to ensure your guide can use their local knowledge of the tides and weather patterns to run the best possible trip for you. All of our guided kayak trips last for 3-3.5 hours, including a pre-trip safety briefing and a 20-30 minute stop on a secluded beach. We break up the trip by the guide providing interesting commentary at notable points of interest along the way. All trips cost $135 per person and include hot drinks and snacks on the beach, as well as photographs taken by the guide throughout the trip. No experience is required for any of our trips, but we do enforce a minimum age of 14 years. We understand that holiday plans can change. If you decided to cancel your trip 5 days or more prior to your trip, we will charge no cancellation fee. Cancellations made within 5 days of your trip incur a 50% fee, and cancellations on the day or no-shows will be charged the full trip price. Heading south from Awaroa we explore the Tonga Island Marine Reserve. This part of the coastline is a productive marine environment bordered by spectacular granite sea cliffs. If conditions permit, we occasionally make it as far south as Shag Harbour, the hidden gem of the Abel Tasman National Park. Schools of fish and gannets plummeting from great heights are commonly seen in this area. Paddling north from Awaroa Beach gives us the chance to explore three of the nicest beaches in the Abel Tasman National Park. Waiharakeke Bay, Goat Bay and Totaranui all contain golden sand beaches surrounded by a backdrop of native New Zealand forest. At low tide we can explore the rock pools and the interesting creatures which inhabit them. This trip opens up the opportunity to try kayak sailing back into Awaroa Bay with the prevailing northerly seabreeze. 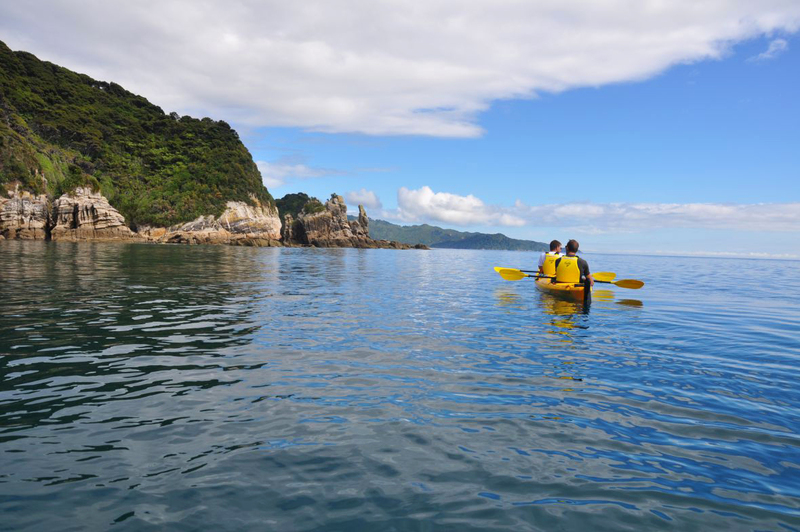 The Awaroa Lagoon provides spectacular views in a sheltered environment to explore by sea kayak. The crystal clear waters reflect different shades of blue and green as the light interacts with the channels and shell beds on the seafloor. Eagle rays are commonly seen cruising the shallows in search of an easy meal. The lagoon is the best place to learn about the rich history of the Awaroa area, as this is where the early settlers established themselves.